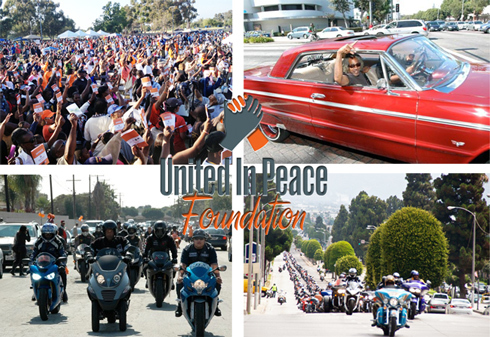 COMPTON (FinalCall.com) - A multi-ethnic, multi-faith coalition gathered for the 10th United in Peace Foundation’s Peace Ride in honor of slain Florida teen Trayvon Martin. Hundreds of motorcyclists and low riders participated in their largest ride ever on July 28. Decked in orange, grey and classic black leather, they also held their first multi-city ride in honor of the thousands of families whose children have been gunned down in senseless violence throughout the country. The grassroots coalition has taken a unique and unusual approach to issues of race and justice, that have resurfaced since a jury of six acquitted Trayvon Martin’s killer, George Zimmerman, on July 13. Their aim is to reinvigorate the spirit of the 1995 Million Man March, wherein more than two million Black men responded to the call of the Honorable Minister Louis Farrakhan to meet him in Washington, D.C. and pledge to become better fathers, husband, and stewards of their communities.